The 5th Thessaloniki Pride is dedicated to the combat against hate speech. The hateful speech that incites, encourages and justifies hatred against LGBTI people and can lead to discrimination and crimes against them is a phenomenon that must be addressed, since in all evidence it is linked to the rise of homo/transphobic violence, but also to the negative impact on the fragile LGBTI youth psychology, such as depression and increased suicidal tendencies. The most effective response is the instant reaction of the society to hate speech of any kind and source (institutions, public figures, internet, social environment) reproducing messages of love and support. That is why the motto of the 5th Thessaloniki Pride coincides with the famous Gospel saying “love one another” (John, 13:34). It is the best response to the advocates of homo/transphobic hate, who often cite religion, misinterpreting it, to stigmatize LGBTI people. The androgynous playing card figure of the poster (Queer of Hearts) denotes that love always prevails over hate. 17:30-23:30 ALL DAY COCKTAIL PARTY, Kalapothaki str. 22:30-2:00 STREET PARTY, Chrimatistiriou sq. 12:00-17:30 PRIDE FAIR, White Tower sq. 17:30-18:30 PRIDE WARM UP, White Tower sq. 18:30-19:30 STATEMENTS OF SUPPORT, White Tower sq. 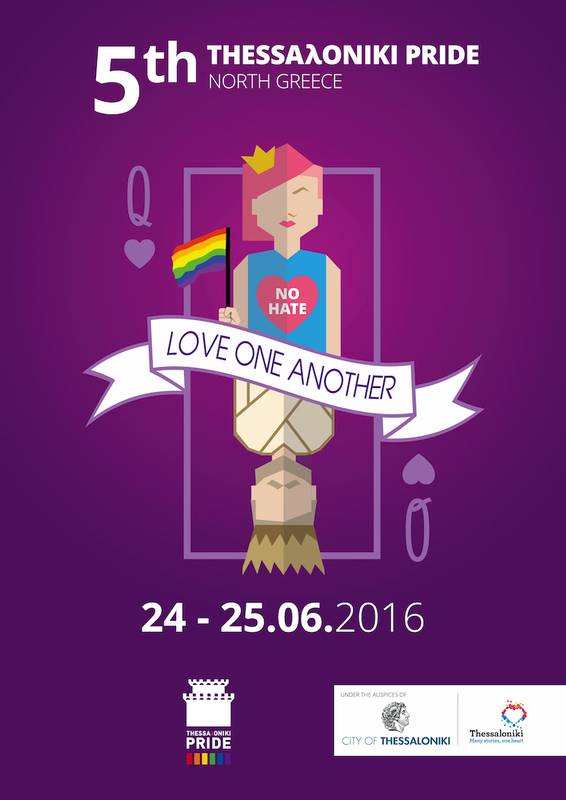 21:30-00:30 PRIDE CONCERT, White Tower sq.